Maryjane insptired slip on. 100% vegan. Woven cotton foam cushioning. Rubber/poly sole. 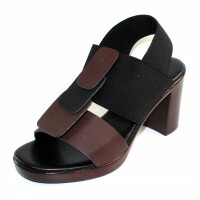 1 inch wedge heel with 1/2 inch platform. Made in Italy. A unique collaboration of old world and new. Introducing the ‘Rapisardi/Ron White’ collection. A new collaboration taking on the heritage and innovation of the legendary Rapisardi brand under the creative direction of renowned Canadian Shoe Designer Ron White, creator of the world’s first All Day Heels. A unique sustainable element to this collection is that it’s 100% Vegan using only vegetable based components and chemical free glues alongside natural materials such as cereals, grains and seeds to create the collection. Rapisardi is proud to be animal free and are members of ‘Animal Free Fashion’ by LAV, an industry leader in vegan certification. Special technologically advanced materials are also used for the sock linings (the material under the foot) which are both breathable and absorbent. A thick all natural woven cotton foam cushioning is used throughout the collection that also adds exceptional padding and increased breathability. In addition, a special ultralight outsole is used made from Rubber and Polyurethane. These outsoles are very durable, non-slip, water resistant and add additional cushioning. Maryjane insptired slip on. 100% vegan. Woven cotton foam cushioning. Rubber/poly sole. 1 inch w..